21st Century skills documents by various professional organizations have presented a complex challenge to teacher librarians to combine the teaching of inquiry and personal habits, critical and creative thinking. 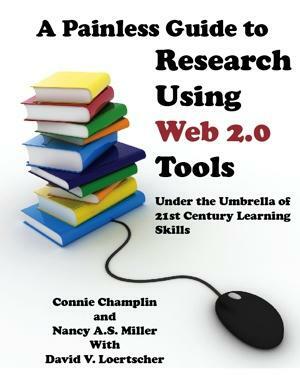 When the authors noted that a collaborative learning thread ran through all the skills documents, Web 2.0 technologies came to mind as a way to teach the research process and meet the areas of 21st century learning at the same time. To pave the way for this idea to take bloom, the authors begin by recommending that teacher librarians adopt a school-wide information literacy model of their choice. Then using the seven steps of the Savvy 7 research model as an example, they select a Web 2.0 application as an easy way to teach that skill in a collaborative manner. In a two-page spread, the authors introduce the tool and help you get started. And, if that tool does not meet your needs, they recommend other tools that might. Then to wind up the teaching of each skill, they provide an evaluation measure that assesses 21st century skills. Thus, the plan is to teach, reflect, and assess across the skills during the research assignment. For a major project such as a lengthy term paper, the entire process might happen on Web 2.0 tools. However, any step that matches a particular assignment can be taught and tested as appropriate. The authors believe that once teacher librarians get the idea of using Web 2.0 technologies, they will become quite creative with the tools acceptable in their own districts. A wiki accompanies the book for users to share experiences and provide tips for others.